BRAINBOX RS-232 Serial Terminal for Ethernet 102 (V2) Interface. The UART functionality in the Ethernet-102 (V2) Interface is a special option and only inplemented on customer request. The Ethernet-102 (V2) interfaces that support this functionality have an extra connector for the serial signals to interface. The program 'EEG_Serial_Monitor.exe' is a simple tool that will give the software designers the possibility to communicate with this application via the UART in the Ethernet 102 (V2) Interface to a connected device on the special serial interface connector. The Ethernet 102 (V2) Interface must be connected to the PC-network and the power must be on. It is not permitted that there is already a connection made by an another program to the same Ethernet 102 (V2) Interface. 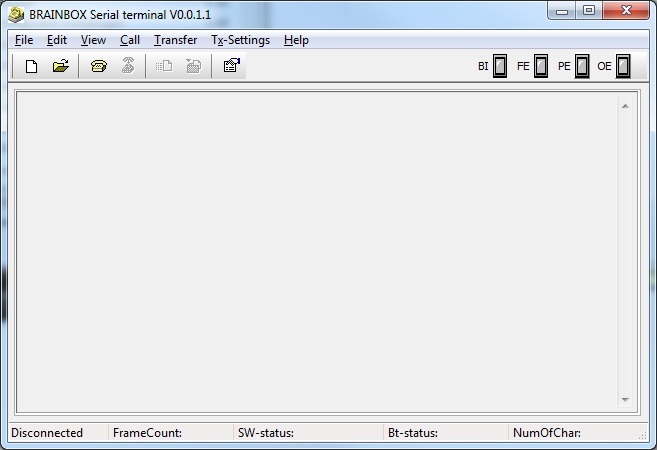 The program start with a general screen. First a connection must be made to the Ethernet-102 (V2) Interface by pressing the most left button of the button bar. In the TCP-IP connect screen the correct IP-address and port number of the Ethernet-102 (V2) Interface must be fill in. After pressing the 'Connect' button the program try to find the network device by pinging this address. By default the Ethernet-102 (V2) Interface is pre-programmed on IP-address 10.0.0.160. 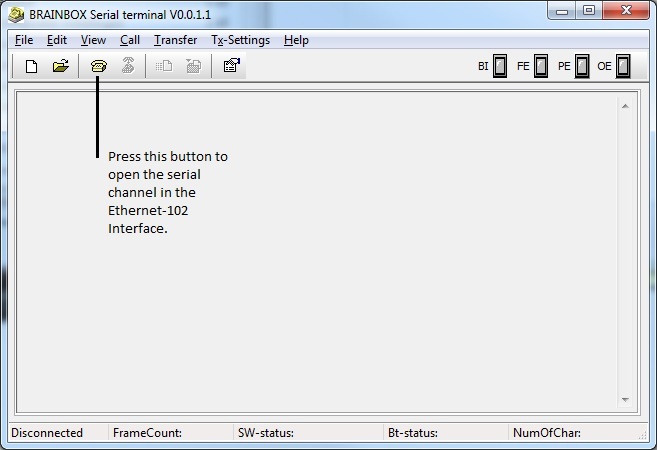 Press the button (see below) to open the serial channel in the Ethernet-102 (V2) Interface. Now there is communication possible to the serial channel. For more information see the help of the application in the main menu bar. For installation of the software one file is needed. With this file the application will be installed. © 2011 by BRAINTRONICS. All rights reserved. THE PROGRAM IS PROVIDED BY BRAINTRONICS "AS IS" WITHOUT WARRANTY OR CONDITION OF ANY KIND EITHER EXPRESS, IMPLIED, OR STATUTORY, INCLUDING, BUT NOT LIMITED TO, ANY IMPLIED WARRANTIES OR CONDITIONS OF MERCHANTABILITY, FITNESS FOR A PARTICULAR PURPOSE AND/OR NON-INFRINGEMENT. THE ENTIRE RISK ARISING OUT OF THE USE OR PERFORMANCE OF THE PROGRAM AND SUPPORT REMAINS WITH YOU. IN NO EVENT WILL BRAINTRONICS BE LIABLE FOR ANY LOST PROFITS, LOST SAVINGS, LOST REVENUE, LOST DATA OR FOR ANY DIRECT, INDIRECT, INCIDENTAL OR CONSEQUENTIAL DAMAGES, EVEN IF BRAINTRONICS HAVE BEEN ADVISED OF THE POSSIBILITY OF SUCH LOSSES OR DAMAGES. IN ADDITION BRAINTRONICS WILL NOT BE LIABLE FOR ANY DAMAGES CLAIMED BY YOU BASED ON ANY THIRD PARTY CLAIM.